3. Alexander H. Wood Sr. Son of Peter Wood & Janet "Jessie" Cleghorn. Born 19 Jul 1835 in Kelso, Scotland. Died June 1899 in Boston, MA. Occupation Wholesale Liquor Dealer. From IGI, Alexander Wood was born 19 Jul 1835. Alexander is not listed in any of the early Census for the Harvey area, York Co., New Brunswick. Unknown when he came from Scotland, but probably came with his mother Jessie and brother George. 4269. 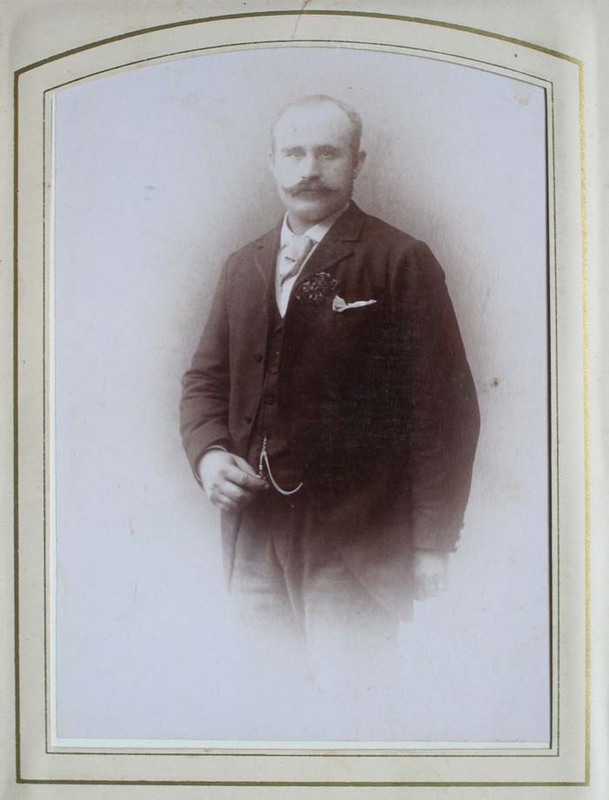 Undated photograph of unidentified male subject. J Swan Hall commented (31 May 2009): "Could this perhaps be an older version of Alexander H. Wood #4292". 2959a. 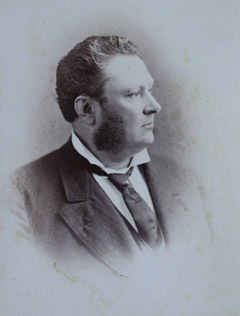 Undated photograph of Alexander H. Wood Sr. Photographer: J. Notham. Source: Ross Wood, Tweedside, Harvey Station. Rephotographed by Tim Patterson. 7 Aug 2008. 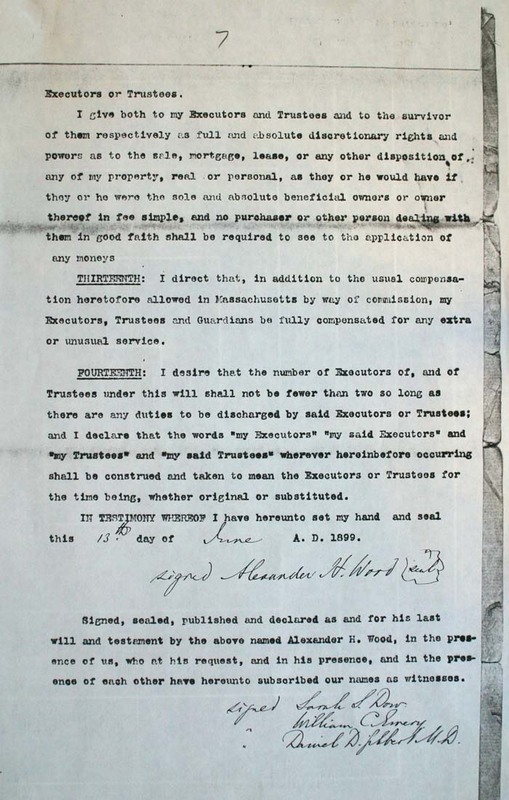 From the grantor/grantee index for York County, NB (Norman DeMerchant, Fredericton, 6 Mar 2009): In 1858 Alexander H. Wood purchased land in Manners Sutton (Parish) and lived in Manners Sutton. In 1861 "purchased land in Manners Sutton but lived in Saint John". 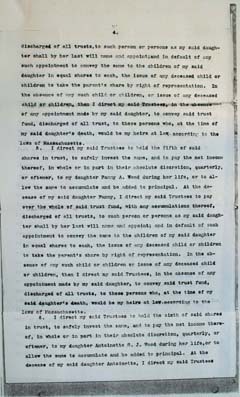 A deed from 12 Nov 1885 registered in the York County Registry Office (NB) lists Alexander H. Wood of Boston and wife Antoinette. In the early 1890's he sold the land to his brother Peter Wood of Manners Sutton. He and his wife Antoinette C., both of Boston executed the document. Alexander "Sandy" moved to Saint John NB at some point prior to 1870 and was good friends with several chaps from that city. The most important was William F. Bunting who kept journals of his day to day life in Saint John. Bunting and Wood were avid fishermen and purchased salmon fishing waters from the NB & NS Land Company in 1873 on the SW Miramichi River in the Parish of Stanley. Sandy removed to Boston from Saint John in 1867 (William Franklin Buntings manuscript diaries (Vol. 4) held at the NB Museum in Saint John--N. DeMerchant, 6 Mar 2009.). In partnership with Marshall S. Pollard he established a liquor distribution firm and and a cigar and grocery business both operating under the Wood Pollard & Co banner. 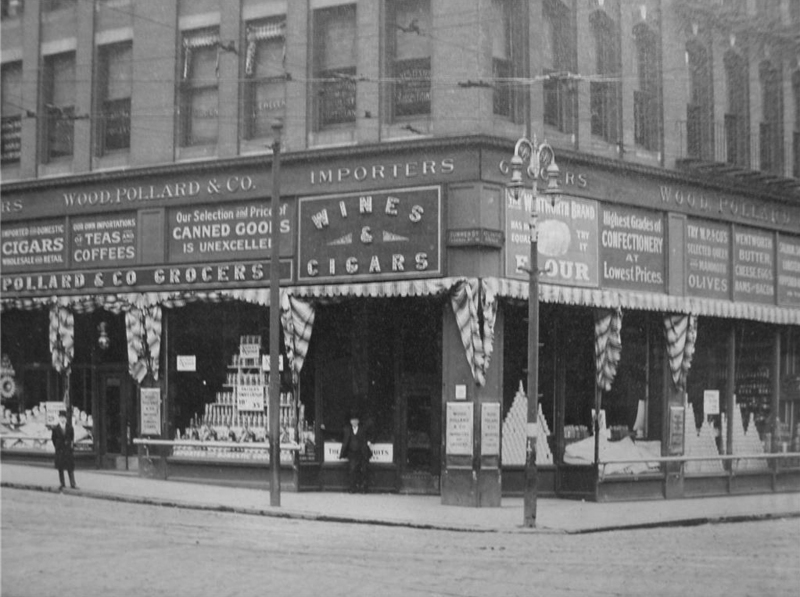 According to the 1872 Directory of Boston the Wood, Pollard, & Co. Cigar and Grocery store was located at 204 Washington while the Wood, Pollard, & Co. liquor firm was located at 100 & 102 Broad. 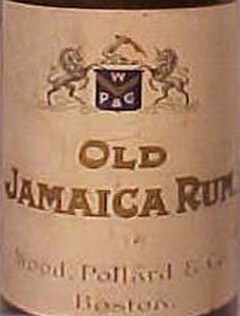 According to an 1892 listing of companies supplied by warehouses of the Mayfield distillery (RD #229, 5th District of KY) the Wood, Pollard & Co. 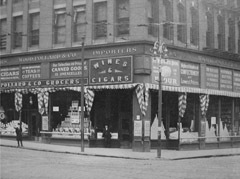 Liquor businesssat the corner of Friend and Causeway sold liquor under the following brand names: "Cordova V. O. Rye", "Elmwood", "Kit Carson", "Lexington A A A", "Lexington A Rye", "Nectar Gin", "New Life Malt", "Old Haynor", "Oxford Rye", "Snowdrop Gin", "The Oxford", "Very Old Cabinet 1873", "W. P. & Co. Special Reserve Rye", and "White Wheat Whiskey." 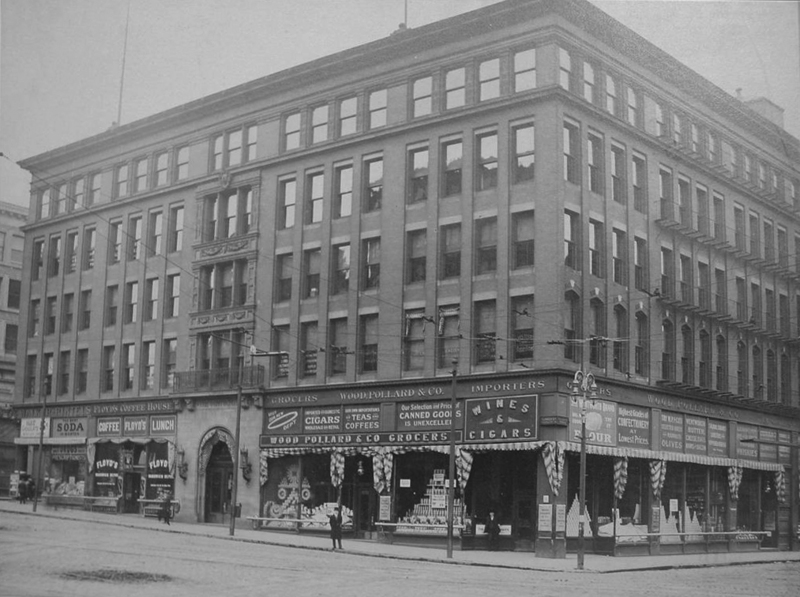 Undated large format (14X12 inch photo) photograph pasted to cardboard from downtown Boston, Mass of several businesses including Wood Pollard & Company. Grocers: Wood Pollard & Company Importers - Wines & Cigars "Our selection and prices of canned goods is unexcelled"
Photographer: Stamp on reverse lists Block & Flynn located at 124 Broadway in South Boston. 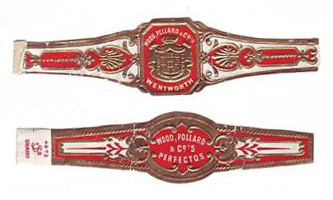 Image of two Wood Pollard cigar bands, which would have been sold at the Wood Pollard store above. Source: eBay sale, June 2009. 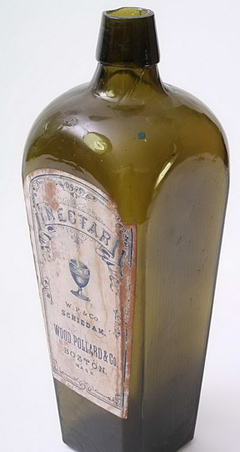 Image of Wood, Pollard & Co. Shot glass. 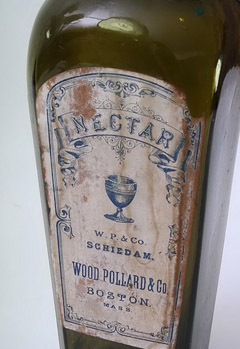 Close-up above of Wood Pollard & Co Liquor bottle illustrated right. He became acquainted with some of the leading figures of the Boston area and would bring them fishing in New Brunswick. Some of the names he has been associated with are Joseph Jefferson (the famous actor), William E. Russell Governor of Massachusetts, and Grover Cleveland, President of the USA (e.g. see 1893 newspaper clipping below and two other clippings in the supplementary data section at bottom of page concerning a terrible 1893 fire at Joe Jefferson's summer home). Secretary Lamont at Gray Gables. Buzzard's Bay. Mass, Aug 25. 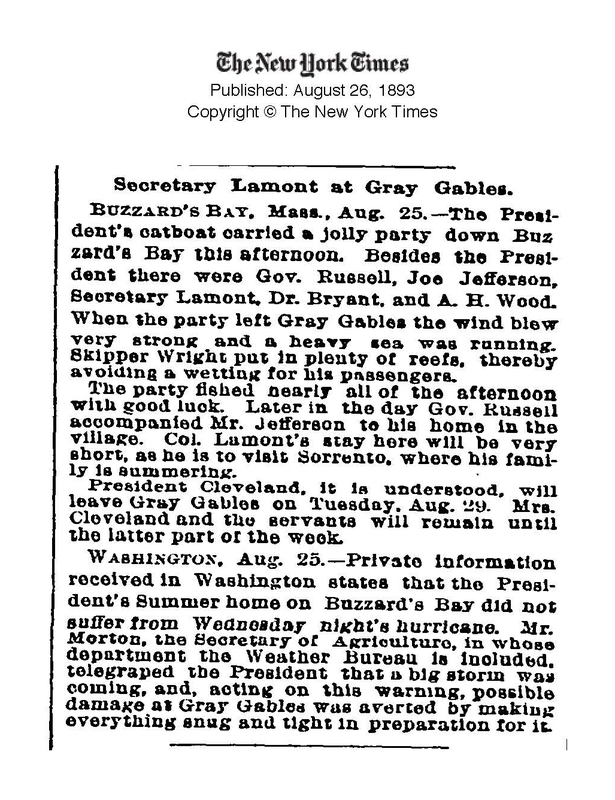 - The President's catboat carried a jolly party down Buzzard's Bay this afternoon. Besides the President there were Gov. Russell, Joe Jefferson, Secretary Lamont, Dr. Bryant, and A.H. Wood. When the party left Gray Gables the wind blew very strong and a heavy sea was running. Skipper Wright put in plenty of reefs, thereby avoiding a wetting for his passengers. 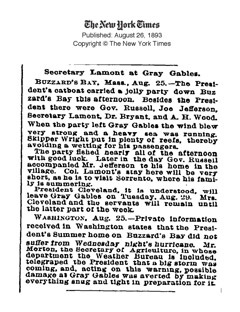 President Cleveland, it is understood, will leave Gray Gables on Tuesday, Aug. 29. Mrs. Cleveland and the servants will remain until the latter part of the week. Source: Norman DeMerchant, Fredericton. 6 Mar 2008. Sandy Wood came back to New Brunswick regularly, every summer to fish on the Miramichi. 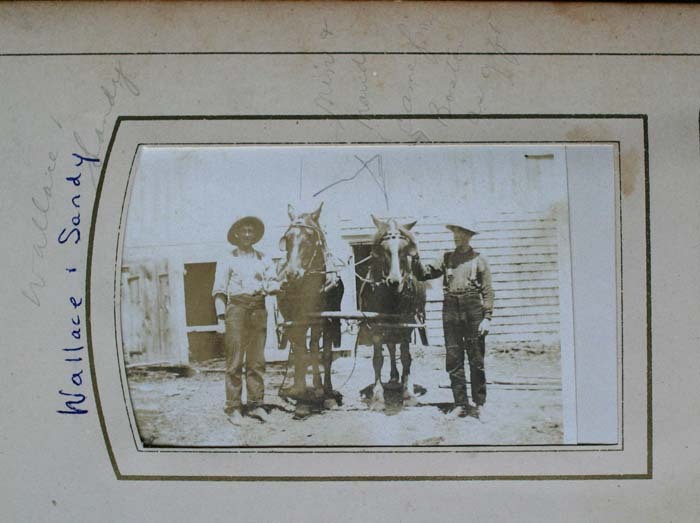 He visited Harvey often, even in the early years of the 1870's, as the Western Extension of the railroad ran from Saint John to McAdam, through Harvey. When he finished his fishing trips, or before he started, it would be a short detour to visit the family. 1870 United States Federal Census, Boston Ward 16, Suffolk, Massachusetts; Roll: M593_649: Page 446: Alexander A. Wood, born abt 1835, age 35, birthplace: Scotland; Home in 1870: Boston Ward 16, Suffolk, Massachusetts; White; Male; In the same household: Frances J. Wood, born abt 1844, age 26, birthplace, England, White, Female; and "Not Named Wood", born abt 1870, age 1/12, white, male. From the 1880 United States Census Household Record, Boston, Suffolk, Massachusetts--Family History Library Film 1254561, NA Film Nmber T9-0561, Page #38D: Household -- Alexander H. Wood, widowed, age 45, born Scot., occupation - Wholesale Liquor Dealer, Father's birthplace - Scot., Mother's Birthplace - Scot. ; Frank L. Wood, son, age 10, born MA, at school, Father's birthplace - Scot., Mother's birthplace - Eng. ; Ada B. Wood, dau, age 7, born MA. ; Jessie G. Wood, dau, age 5, born MA. ; Jessie Wood, Mother, widowed, age 75, born Scot., At Home, Father's birthplace - Scot., Mother's birthplace - Scot. ; Maggie Crotty, female, age 26, born Ire., Domestic Servant. Boston, Massachusetts Directory, 1890, Alexander H. Wood, Location 1: 95 Water; Location 2: Savin Hill avenue; Business Name: Wood, Pollard, & Co.
A copy of his Will, signed 13 Jun 1899, listed his children, and also gave his home address as Savin Hill, Boston, County of Suffolk, Commonwealth of Massachusetts, U.S.A.
Alexander's funeral was on June 21, 1899 at his home. He most likely passed away a few days earlie at mostr. The funderal was well attended by his business associates and particularly his fishing buddies, notabley Ex President Grover Cleveland and Joseph Jefferson, the renowned actor. 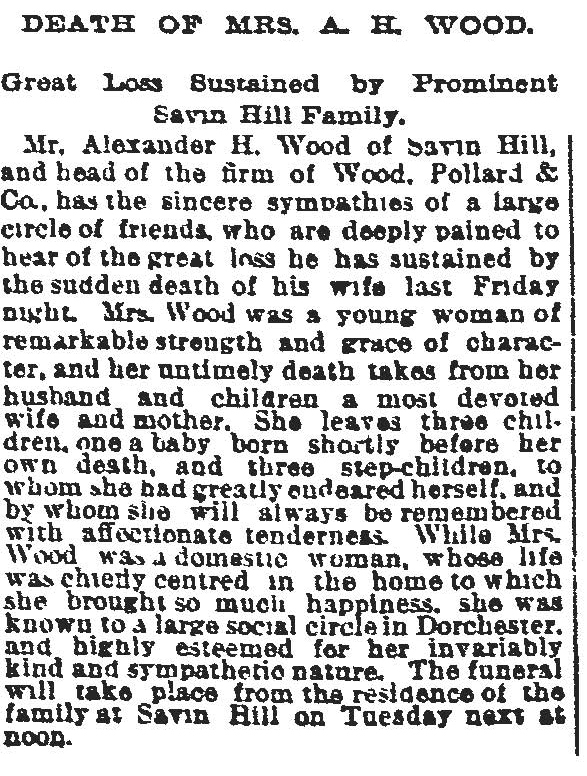 At 2:30 yesterday afternoon a number friends of the late Alexander H. Wood of the firm of Wood, Pollard & Co, assembled at the family residence on Savin Hill av. Dorchester, to pay their final tribute of love and respect to his memory. 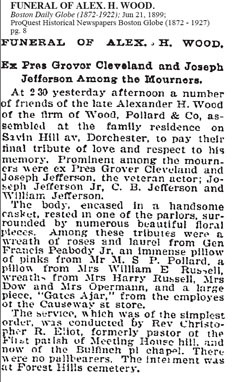 Prominent among the mourners were ex Pres Grover Cleveland and Joseph Jefferson, the veteran actor; Joseph Jefferson, Joseph Jefferson, Jr, C.B. Jefferson and William Jefferson. The body encased in a handsome casket, rested in one of the parlors, surrounded by numerous beautiful floral pieces. Among these tributes were a wreath of roses and laurel from Gen Francis Peabody Jr, an immense pillow of pinks from Mr. M.S.P. Pollard, pillow from Mrs Willim E. Russell, wreath from Mrs. Harry Russell, Mrs. Dow and Mrs Opermann, and a large piece, “Gates Ajar, “ from the employees of the Causeway St. store. Source: Tim Patterson, Ottawa & Norman DeMerchant, Fredericton. 27 April 2010. First: I give and bequesth to such sons and daughters of my late brother Peter Wood and of my late brother George Wood as survive me, a legacy of two hundred and fifty (250) dollars each. Second: I give and bequeath to such servants in my employ at the time of my death as my Executors shall certify have been with me for the term of four years prior to my death, a legacy of One hundred (100) dollars each. Third: I give and devise to my eldest son, Frederick W. Wood the land and house where he lives, numbered 109 Savin Hill Avenue, Boston, free and discharged of mortgage. 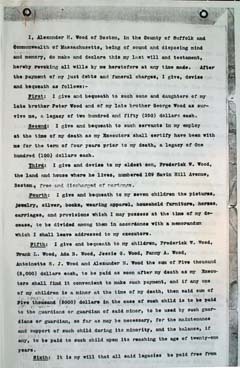 Fourth: I give and bequeath to my seven children the pictures, jewelry, silver, books, wearing apparel, household furniture, horses, carriages, and provisions which I may possess at the time of my decease, to be divided among them in accordance with a memorandum which I shall leave addressed to my executors. 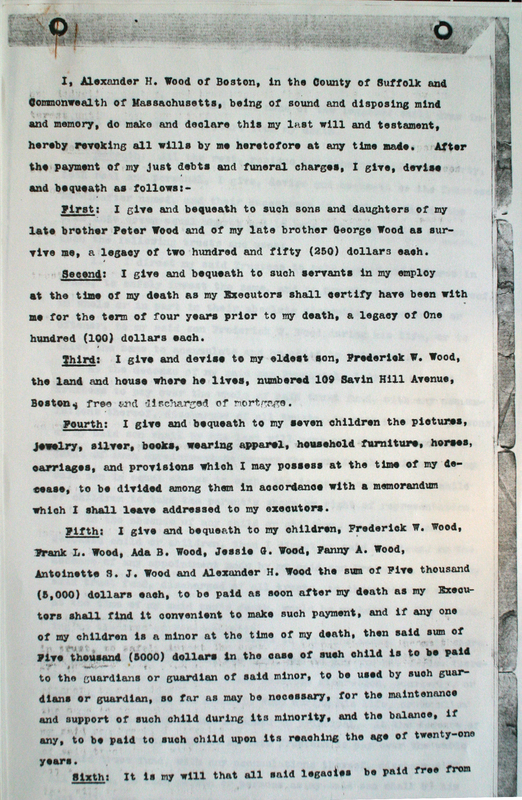 Fifth: I give and bequesth to my children, Frederick W. Wood, Frank L. Wood, Ada B. Wood, Jessie G. Wood, Fanny A. Wood, Antoinette S. J. Wood and Alexander H. Wood the sum of Five thousand (5,000) dollars each, to be paid as soon after my death as my Executors shall find it convenient to make such payment, and if any one of my children is a minor at the time of my death, then said sum of Five thousand (5000) dollars in the case of such child is to be paid to the guardians or guardian of said minor, to be used by such guardians or guardian, so far as may be necessary, for the maintenance and support of such child during its minority, and the balance, if any, to be paid to such child upon its reaching the age of twenty-one years. Sixth: It is my will that all said legacies be paid free from any deduction or tax, and that none of the legacies shall draw interest until after two years from my death. 1. 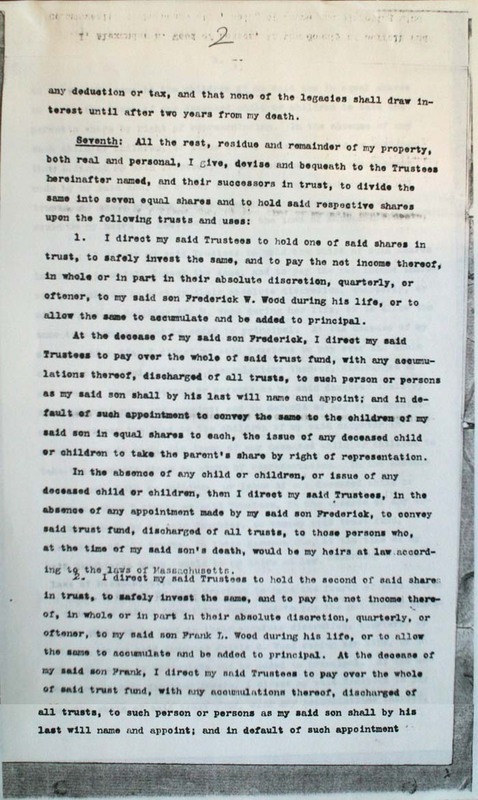 I direct my said Trustees to hold one of said shares in trust, to safely invest the same, and to pay the net income thereof, in whole or in part in their absolute discretion, quarterly, or oftener, to my said son Frederick W. Wood during his life, or to allow the same to accumulate and be added to principle. 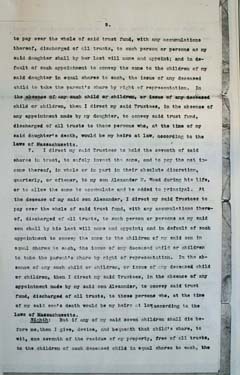 At the decease of my said son Frederick, I direct my said Trustees to pay over the whole of said trust fund, with any accumulations thereof, discharged of all trusts, to such person or persons as my said son shall by his last will name and appoint; and in default of such appointment to convey the same to the children of my said son in equal shares to each, the issue of any deceased child or children to take the parent's share by right of representation. In the absence of any child or children, or issue of any deceased child or children, then I direct my said Trustees, in the absence of any appointment by said son Frederick, to convey said trust fund, discharged of all trusts, to those persons who, at the time of said son's death would be my heirs at law according to the laws of Massachusetts. 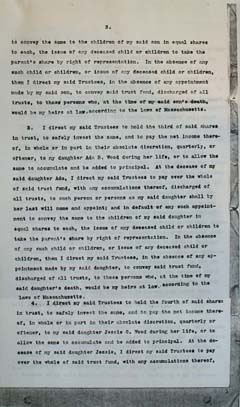 Ninth: The several trust share shall be fixed by said Trustees in their absolute discretion, and they may take undivided interests in any property that I may leave in establishing the several trusts, and they may manage said Trusts separately, or together, two or more, as they may see fit. 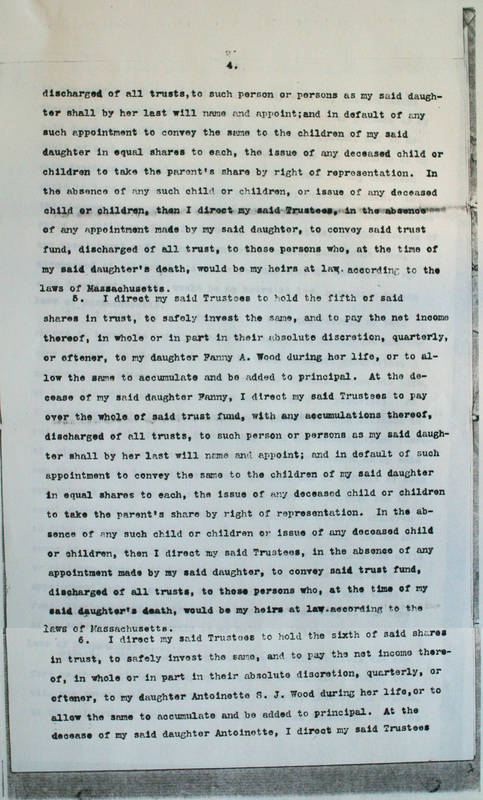 Tenth: I desire that after my death my homestead at Savin Hill shall remain as a home for such of my children as shall desire to live there, and I therefore empower my Executors and Trustees to allow such children to continue to occupy the said homestead after my death without the payment of rent, each child who lives there contributing its share towards taxes on, and repairs, insurance and maintenance of said house and land, but I give my Executors and Trustees full power to sell said homestead and the land belonging therewith, or any part of said land, whenever they shall deem it wise and expedient so to do. Eleventh: I hereby appoint Francis Peabody Jr., and Charles S. Rackemann, both of Milton, guardians of such of my children as shall not have reached the age of twenty-one years at my death, such guardianship to continue during the child's minority, and it is my desire that such guardians shall not be required to give a surety or sureties upon their official bonds. 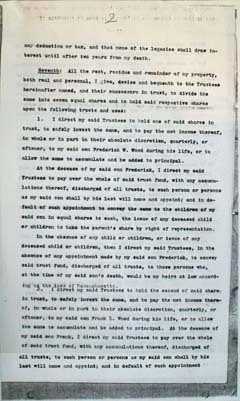 Twelfth: I hereby appoint said Francis Peabody Jr., and said Charles S. Rackemann, Executors of this Will; and said Francis Peabody Jr., Marshall S. P. Pollard and said Charles S. Rackemann, Trustees under this will, and I request that they be exempt from giving surety or sureties upon their official bonds, whether as Executors or Trustees. 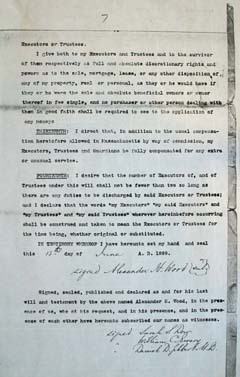 I give both to my Executors and Trustees and to the survivor of them respectively as full and absolute discretionary rights and powers as to the sale, mortgage, lease, and any other disposition of any of my property, real or personal, as they or he would have if they or he were the sole and absolute beneficial owners or owner thereof in fee simple, and no purchaser or other person dealting with them in good faith shall be required to see to the application of any moneys. 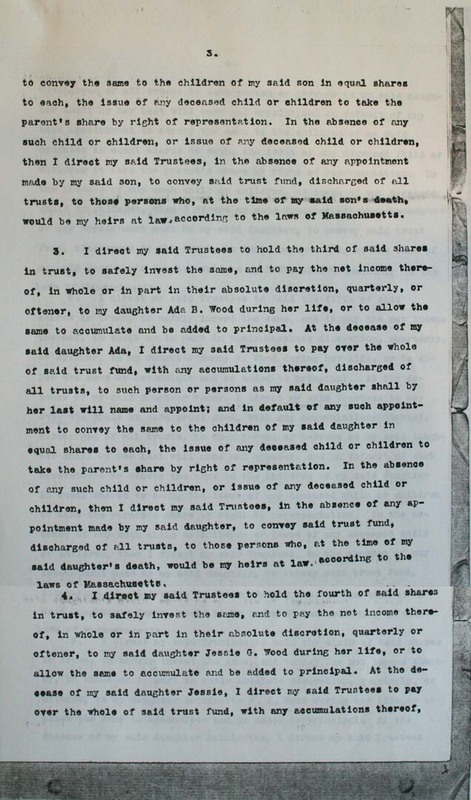 Thirteenth: I direct that, in addition to the usual compensation heretofore allowed in Massachusetts by way of commission, my Executors, Trustees and Guardians be fully compensated for any extra or unusual service. Fourteenth: I desire that the number of Executors of, and of Trustees under this will shall not be fewer than two so long as there are any duties to be discharged by said Executors or Turstees; and I declare that the words "my Executors" "my said Executors" and "my Trustees" and "my said Trustees" wherever hereinbefore occurring shall be construed and taken to mean the Executors or Trustees for the time being, whether original or substituted. 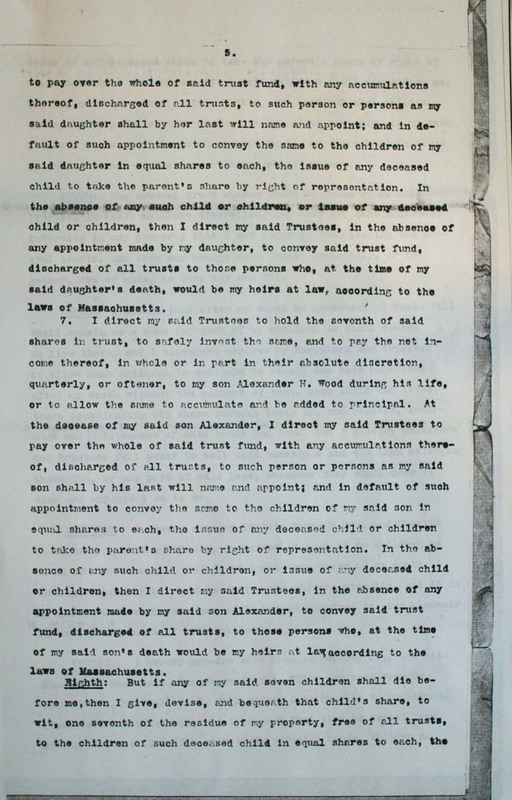 Signed, sealed, published and declared as and for his last will and testament by the above named Alexander H. Wood, in the presence of us, who at his request, and in his presence, and in the presence of each other have hereunto subscribed our names as witnesses. Signed: Sarah S. Dow, William C. Emery, Daniel D. Filbert(? ), M.D. He first married Frances J. Sealy, daughter of John Sealy & Eliza, 8 Sep 1869 in Boston, Suffolk, Mass. Born Approx 1844 in England. Died Before 1880 in Boston. From IGI (Batch #1008713), Frances Sealy, daughter of John and Eliza Sealy, married 8 Sep 1869 Boston, Suffolk, Mass., Alexander H. Wood. 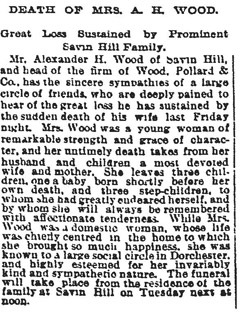 Mr. Alexander H. Wood of Savin Hill, and head of the firm of Wood, Pollard & Co., has the sincere sympathies of a large circle of friends, who are deeply pained to hear of the great loss he has sustained by the sudden death of his wife last Friday night. Mrs. Wood was a yound woman of remarkable strength and grace of character, and her untimely death takes from her husband and children a most devoted wife and mother. She leaves three children, one a baby born shortly before her own deathc, and three step-children, to whom she had greatly endeared herself, and by whom she will always be remembered with affectionate tenderness. While Mrs. Wood was a domestic woman, whose life was chiefly centred in the home to which she brought so much happiness, she was known to a large social circle in Dorchester and highly esteemed for her invariably kind and sympathetic nature. The funeral will take place from the residence of the family at Savin Hill on Tuesday next at noon. Source: Tim Patterson, Ottawa & Norman DeMerchant, Fredericton. 6 Mar 2008. From 1870 United States Federal Census, Frances J. Wood was born abt 1844 in England, was 26 years old, and living in Boston Ward 16, Suffolk, Massachusetts. Died before 1880 Census, Alexander is listed as Widowed. The mother of the children's birthplace is given as England. He second married Antoinette C. Urann, 1882. 19 iii. Alexander H. Wood Jr.
Volume 3 - January 20th 1877 Alex Wood, 124 Purchase Street Boston. Volume 3 - June 25th, 1876 Note to Alex Wood of Boston. Volume 4 - May 5th 1882. Received note from Alex Wood of marriage to Antoinette C. Urann. Volume 4 - Alex H. Wood removed to Boston from Saint John in 1867. 4303. 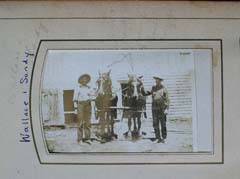 Undated photograph of Wallace and Sandy Wood with horses "Min and Maud that came from Boston as a gift". The provider of the gift was most likely Alexander (Sandy) H. Wood Sr. (see 4292 above). The similarly named John Alexander (Sandy) Wood in this picture and his brother Walter Wallace Wood were the sons of George Thomas Wood (b. 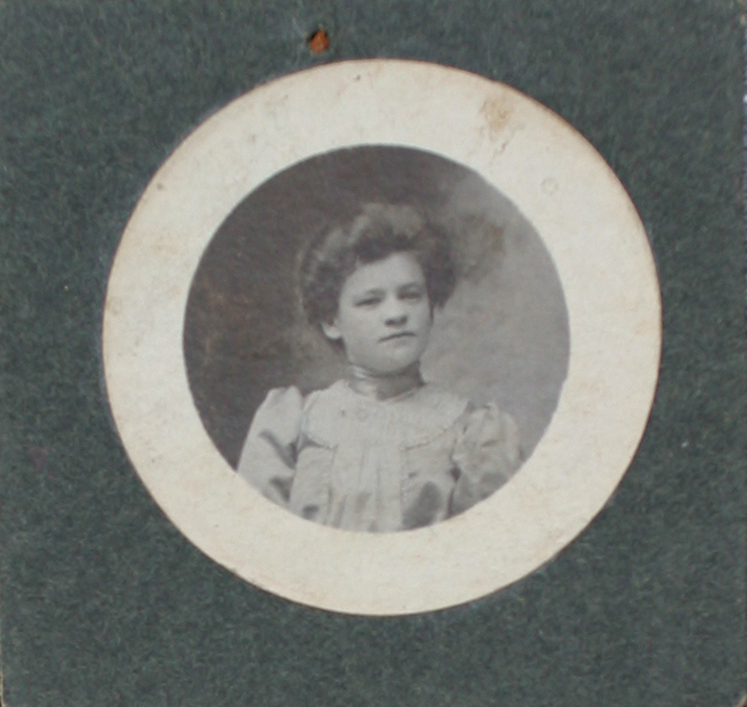 16 Apr 1865, d. 30 Apr 1931) and Elizabeth Messer (b. 8 Nor 1864, d. 8 Jul 1920). Source: Ross Wood, Tweedside, Harvey, York Co., N.B. Rephotographed, by Tim Patterson7 Aug 2008. 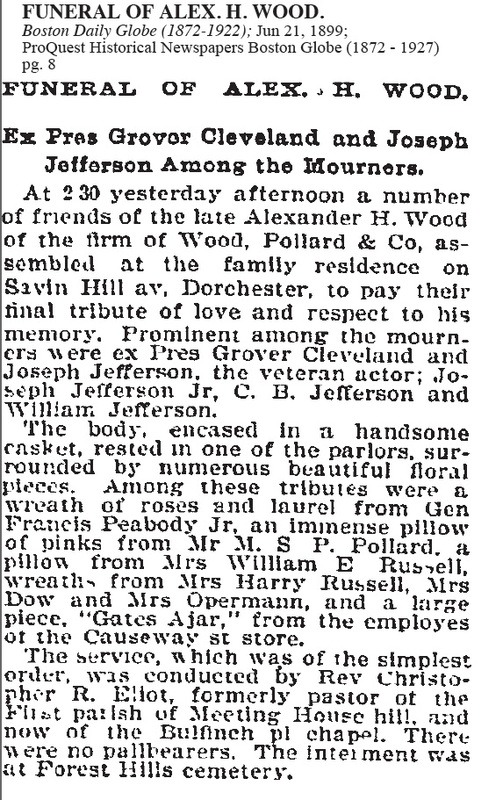 Below are two newspaper accounts of a terrible fire at Crow's Nest, the summer home of the actor Mr. Joe Jefferson, which mention A.H. Wood and other members of his family. GASOLINE LEAKED OUT IN THE CELLAR AND THE FURNACE FIRE EXPLODED IT – HELEN M’GRATH, THE COOK, PERISHED IN THE FLAMES – OTHERS HAVE NARROW ESCAPES. BUZZARD’S BAY, Mass. April 1. – Fire this afternoon totally destroyed the beautiful Summer residence of Joe Jefferson, situated on the shores of Buttermilk Bay, the family cook, Helen McGrath, perished in the ruins. Miss Simmonds, the housekeeper; Miss Collins, the maid, and Miss McGrath were in the cellar at noon, when Miss McGrath discovered what she supposed was water covering the floor. She called the hired man, Mr. Wright, who saw at once that it was oil from the gasoline tank. He shouted to the women to flee for their lives but they stood dumbfounded. The gasoline communicated with the fire in the furnace, and in an instant there was a terrific explosion. Mr. Wright caught Miss Simmonds and Miss Collins and fought his way to the open air. He endeavoured to return for Miss McGrath, but was met by a blinding sheet of flame. Burned and bleeding, he heroically tried to gain entrance but was unsuccessful, and the unfortunate woman was left to perish in the flames. When the cry of fire was raised Mrs. Jefferson was ill in bed, but she hastily arose and luckily escaped, not having time to dress. She was assisted out and covered with buffalo robes. She suffered a severe shock to her nervous system, and was at once removed to the home of Station Agent Bassett, and medical attention summoned. The children who were playing in the attic, were the first to excape and seek a place of safety. The fire spread with lightning rapidity, the whole building soon being a roaring furnace. The entire population was soon at the scene, and repeated attempts were made to enter the building to save, if possible the unfortunate cook. The wind was blowing a gale from the southwest at the time of the fire at the time of the fire, and that alone saved the residences adjoining the Jefferson’s from destruction. Gov. Russell and A.H. Wood who were fishing in the vicinity, were soon at the scene and called on Mrs. Jefferson. Mrs. Jefferson received a telegram from her son from New York stating that he would be here on Sunday, which greatly relieved her, and she is now resting as comfortably as can be expected. She does not yet know that the body of Miss McGrath is in the ruins, and the sad news will be kept from her as long as possible. 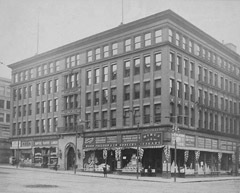 Miss McGrath had been in the employ of the Jefferson’s for twenty years. She was a middle-aged mowan, a devoted Roman Catholic, and her sad and untimely end has cast a deep feeling of sorrow over those who knew her. The large and valuable painting which was to have been exhibited at the World’s Fair was totally destroyed, together with Mr. Jefferson’s costly collection of curios. Gov. Russell searched among the goods saved for some wearing apparel for Mrs. Jefferson, but not a bit had been saved, and Mrs. Jefferson has only the clothes she had on when she escaped from the burning building. It is estimated that $150,000 worth of paintings were consumed, and that the total loss will be $250,000. Mr. Jefferson is en route to California, and word has been sent to him. The house, which was erected three years ago, was designed by the actor himself. It stood on a high bluff overlooking Buttermilk Bay, and was a model of modern architecture. The report of the fire spread rapidly, and over 1,000 people were on the ground in a short time. A squad of special police is on duty tonight watching the fire and guarding the property. Boston, April 1. 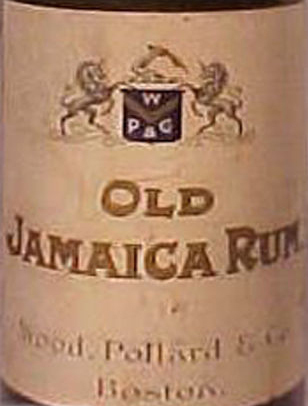 – Destroyed in Crow’s Nest to-day were many unique things of more or less positive value, but much treasured by Mr. Jefferson. In his drawing room were two carved ebony figures with frightful faces, hobnobbing with two tiny bronze elves. The elves sat in front of the andirons on the tiled hearth. An inlaid excritoire, with panels and china, painted in scenes from the gay revels of courtiers of the time of Charles II, contained a case of shallow drawers, with grooves for cigars, in much the same fashion that spools of silk are displayed in a country store. The drawing-room furniture consisted of high-backed, low-seated chairs, beautifully carved in a close and intricate design of foliage, with here and there a peacock spreading himself form a branch. The set was found abroad, bout a piano chair to match was made in America. In this room were treasures from the Old world which would have made a Doge of Venice green with envy. There were piled promiscuously cabinets dainty enough to be kept in cabinets. One of these was of Japanese manufacture. The outside was perhaps 2 feet in height, and was evenly covered with red sealing wax embossed in a conventional design, with here and there an exquisitely-painted medallion imbedded in the surface of the substance. A comfortable, homely, willow easy chair, painted brown with red ribbons run through, stood side by side with an ebony chair of stiff Dutch design. The pearl of great price of this treasure house was a ducal armor, or wardrobe, 7 feet high and 4 broad. It was surmounted by a plumed helmet, with visor partly raised and a shield. The letters “L. X. B..” and “E. B.” were on opposite quarterings of the shield, and underneath is the date, “1673”. Below the shield was carved a festooned rosary, and beneath the cornice moulding a row of grotesque, long-nosed, Dutchy-looking devils in livery, using their long, flattened tails as swords. The entire surface was inlaid with precious woods in ornamental design, and in every panel, held by circular mouldings were large porcelain medallions of rare beauty. The armor was in the dining room in a space specially prepared. On an inlaid table was an ancient mosaic window, about 2 by 4 feet, made up of countless tiny pieces of colored glass, set in lead, and picturing the slender figure of a buskined page descending the spiral stairs of a castle turret. Mr. Jefferson received the news of the burning Crow’s Nest at the Fifth Avenue Hotel yesterday afternoon. He was deeply grieved by the report of the death of the cook, Ellen, who had been twenty years in the family. His eldest son, Charles, started for Buzzard’s Bay last night, and, after Mr. Jefferson was assured of the safety of those members of his family who were in the house, he started with his son William at 7 o’clock on his Western tour. Mr. Jefferson’s property – house, stables, furniture, and pictures – was insured for $70,000. The total value is roughly estimated as between $200,000 and $300,000. He had recently put in a picture gallery and bought some new and extremely valuable canvases. He feared that the fine examples of Mauve and Daubigny recently at the Loan Exhibition in the Fine Arts Building in New-York had been returned and placed on the walls, and therefore were destroyed. Mr. Jefferson owned three Corots, four Troyons, two Deubignys, three Diazes, one Jules Dupré, on Dècamps, two Greuzes, four Mauves, two Israels, (including the large canvas “The Mother”) one Sir Joshua Reynolds, two Sir Thomas Lawrences, three Van Mareks, one Madrago, besides family portraits and a portrait of Macready the actor. In the house were a number of fine wood carvings, books of value, and in fact the art and bibliographic accumulations of a lifetime. Built into it were original modellings by the sculptor Bauer, old tiles and stained glass portraits of Edwin Booth and William Warren. On the main stairway as a large stained-glass window with ta design by Jefferson himself. The house was built substantially and amply, and in every part was characteristic of its accomplished and hospitable owner. It is Mr. Jefferson’s intention to rebuild at once. Crow’s Nest was a picturesque, rambling cottage of stone, built on the edge of the bluff behind Buttermilk Bay. Its site was one of the finest on the Massachusetts coast. It was not a new building, but its construction was of a thoroughness that made it equally delightful in Summer and Winter, and it was occupied by Mr. Jefferson or some of his family most of the time. Mr. Jefferson had gathered his children about him in neighboring cottages, and his family, with their guests, of whom there were always many, formed a settlement by themselves. Since Mr. Jefferson first took possession of Crow’s Nest many well-know guests have been entertained in its big, quaint, low-studded rooms. President Cleveland was a frequent visitor while he was at Gray Gables, a mile and a half away, last Summer, and William H. Crane and Richard Watson Gilder were among the friends who met there. NO TRACE OF MR. JEFFERSON’S FAITHFUL COOK HAS BEEN FOUND. BUZZARD’S BAY, Mass., April 2. – The scene of Saturday’s fatal fire was visited by hundreds of people to-day, and the shores of Buttermilk Bay, in the vicinity of Crow’s Nest, presented an animated appearance. The guard had a lively time at midnight, when the wind suddenly changed to the east and blew a gale. The sparks were blown into the pine woods and were extinguished with much difficulty. Early this morning a search was instituted for the body of Helen McGrath. An entrance was made to the cellar through the door by which the servants escaped. The debris was carefully removed and the search continued all the day, but no trace of the missing woman was found. It is the general opinion that she was instantly killed by the force of the explosion and that the cellar floor being covered with gasoline she was cremated. But the finding of the bones of a dog at noon aroused a hope that the woman’s remains might yet be found. 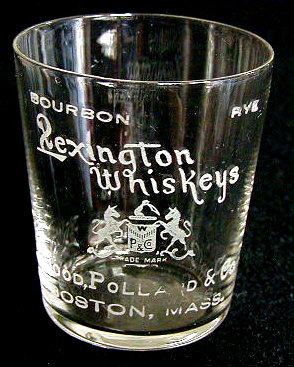 A pair of eyeglasses was also found and it is thought that they belonged to Miss McGrath. The search will be completed by noon Monday. Miss Collinson, the maid, is the most seriously burned of the survivors. She was thrown down by the force of the explosion, and was fright-fully burned on the face, arms, and hands. Her sufferings were intense. When visited by a reporter to-day she was resting as comfortably as could be expected. She lost all her wearing apparel and money. 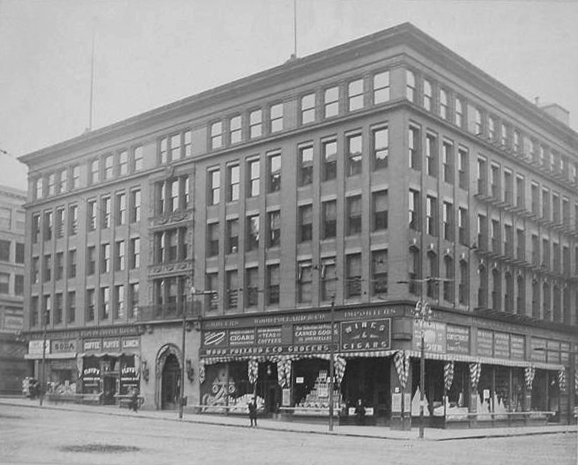 Clarence Whipple, an employe, was also terribly burned on the face, arms and hands, and as he complains of severe pains in his chest, it is feared that he inhaled some of the flames and is internally injured. He is at his home at the head of the bay. Frank Ashport, another employe, was in the cellar at the time of the explosion and is also suffering from severe burns on his face and hands. Whipple and Ashport, although suffering intense pain, heroically endeavored to save Miss McGrath from the flames. Miss Symons was not so severely burned as the others, and has been with Mrs. Jefferson at Mr. Bassett’s. C.B. Jefferson, A.H. Wood, Frank L. Wood, and Miss Ada Wood arrived on a morning train and at once went to Mrs. Jefferson. Mr. Jefferson ordered a careful search of the ruins to be made, and will remain here until it is completed. When seen by a reporter he said that his father was deeply grieved at the sad death of his faithful servant, and that the loss of the property did not appear to affect him. Mr. Jefferson will rebuild on the same site, and will this season occupy the Whittier cottage, which is on the Buzzard’s Bay shore, near Gray Gables. Mrs. Jefferson has been receiving messages of Sympathy all day. Among the first to arrive were those from President Cleveland, Mr. Whittier, and Mr. Benedict. Obituary for Marshall S. Pollard of Wood, Pollard & Co.
MARSHALL S. POLLARD of the firm of Wood, Pollard & Co., wholesale and retail grocers of Boston, died at Driftwook, Marblehead Neck, Mass., Saturday. 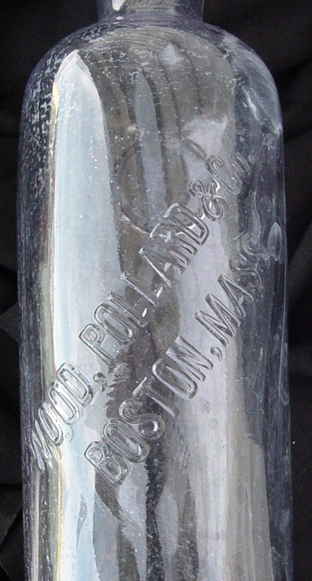 Mr. Pollard was 70 years old.